Why does the plant tag say Elixer of Life? And, who is He Sho Wu? The story goes that a Mr. He, who had been sickly from birth, noticed two trees growing together with their vines embracing. Thinking this most odd, he dug up their roots and took them home for food. Within days he was thinking about embracing someone himself and within months his gray hair had returned to black. He got married shortly thereafter and had a son. He and his son lived to be 130 and ever since Polygonum multiflorum has been called He's Black Hair. You might say it is the very elixir of life. 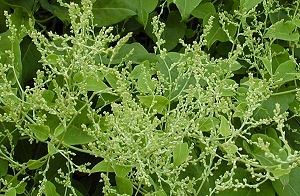 He Shou Wo, also called Fo Ti, is an ancient Chinese healing herb particularly favored by older people. It is said, by the Chinese, to be a 'youth giving tonic' possessing even the quality to reduce the propensity of gray hair on ones head. According to Penelope Ody's excellent book Home Herbal, the rejuvenating properties of Fo Ti make it a good tonic for problems, like menopause, that are associated with run down kidney energies. 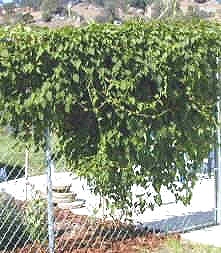 The sprawling twining runners of Fo Ti very quickly reach 30 feet and can cover four square feet of fence or trellis in about two months. This is a beautiful deep green vine that has stayed evergreen at just below freezing. In England it is sometimes referred to as fleeceflower and it is certainly an appropriate name. 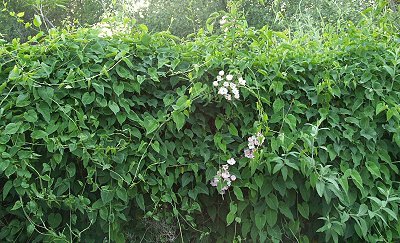 When Fo Ti flowers, the little cream colored flowers are in such great abundance it is as if the whole plant is covered with fine cotton. In about four years, the fence planting above took over four sections of chain link fence. In the photo to the left a Ballerina Rose pokes through the leafy green mass. 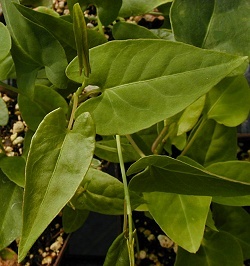 This plant is sometimes available in plug trays. These trays hold 128 of all the same plant. They are a great low cost way to fill a lot of space. Each cell is 3/4 of inch by an inch. Check here to see if Fo-Ti Plug Trays are available. but average is 30 Feet.